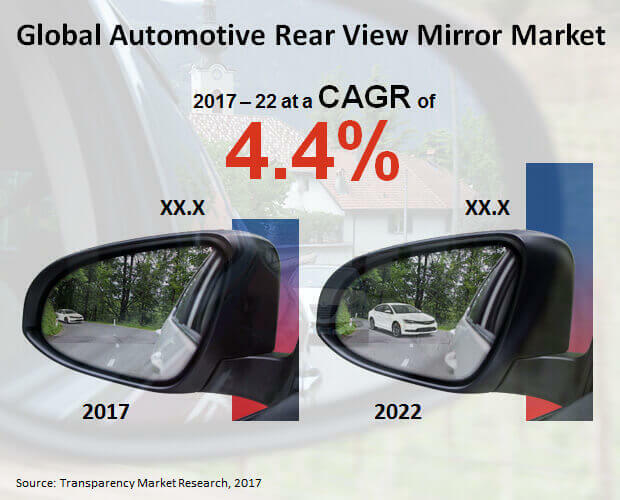 An up-to-date intelligence study by Transparency Market Research (TMR) has detected that the global automotive rear view mirror market is marked by technological advancements and the presence of a large number of players, who are making the competitive landscape distributed. Having said that, a few vendors do hold a position of strength in the global automotive rear view mirror market, such as Gentex Corporation, Samvardhana Motherson, Magna International, Murakami, and Ficosa, whereas some of the other promising players are Honda Lock Manufacturing, FLABEG, Ichikoh Industries Ltd., SL Corporation, Lumax Automotive Systems Ltd, Burco Inc., Flabeg Automotive Holding GmbH, Valeo SA, Continental AG, Sakae Riken Kogyo Co., Ltd., Tokai Rika, and Metagal Industria e Comercio. Among these, Gentex currently has a good hold over the automotive rear view mirror market, which is a reflection of its innovations and strategic acquisitions. The company was the first one to introduce electromechanical auto dimming mirrors and had recently acquired Homelink from Johnson Controls. The company offers cost-efficient products that meet all the advanced features of display and safety, such as microphones, display, antennas, and cameras. Gentex currently caters to various leading players of the automotive industry, including Audi, Ford Motor Company, BMW, GM, Fiat Automobiles, and Rolls-Royce. As per the evaluations of the TMR report, the global automotive rear view mirror market was worth US$8.96 bn in 2017. The demand is projected to increment at a CAGR of 4.4% during the forecast period of 2017 to 2022 to reach an estimated global worth of US$11.13 bn by 2022. Product-wise, in 2017, the flat mirror segment accounted for 27.9% of the overall demand and is expected remain the dominant segment throughout the forecast period. Geographically, North America and Europe are two most profitable regions, although the region of Asia Pacific except Japan (APEJ) is projected for the most robust growth rate. Some of the key factors favoring the global automotive rear view mirror market are: increasing awareness regarding vehicle and passenger safety, growing trend of integrating additional features by the manufacturers to provide a premium product to their customers, increasing demand for higher segment vehicles as a result of increasing disposable income among the consumers, increased investments in research and development, and rising adoption in aftermarket. According to a 2015 report by the WHO, more than 1.2 million deaths occur every year as a result of moderate road traffic safety measures. As the passenger car segment gains momentum, owing to rapid urbanization and increasing disposable income, the demand in the automotive rear view mirror market is expected to increment steadily. The report also detects that the ability of blind spot detection system to measure the distance and closing speed of objects in adjacent lanes enables it to alert the driver of the vehicle whether a collision is imminent. This ability to prevent blind spot accidents along with the power control feature of the mirror is expected to gain awareness in the near future and drive the global automotive rear view mirror market. Despite apparent benefits and decreased product cost, the global automotive rear view mirror market is challenged by factors such as functional and operational issues, high replacement cost of smart rear-view mirror, and preference for conventional mirrors among the prospected consumers in cost-effective emerging economies. Nevertheless, integration of infotainment and navigation application such as radar, camera, and LED technologies are opening new opportunities in the global automotive rear view mirror market.